Okay, so I KNOW there's a ton of research saying you need to keep screens like TV and iPads away from kiddos until they're 2. TRUST ME, it seems like I've read it ALL, and we truly tried. Like many other things we tried to avoid when we became parents, it just happened into our lives and actually was a saving grace once in a while. Sometimes you just need a minute or two of silence, or you need Elmo to babysit while you shower. I won't judge you, because I know exactly how it feels. Enter iPad. Of course a child would be curious about this neat thing that is bright, makes sounds, and responds to you touching it. She wanted to try, too. So I wanted an app that she could actually interact with and be entertained by. I began to search! 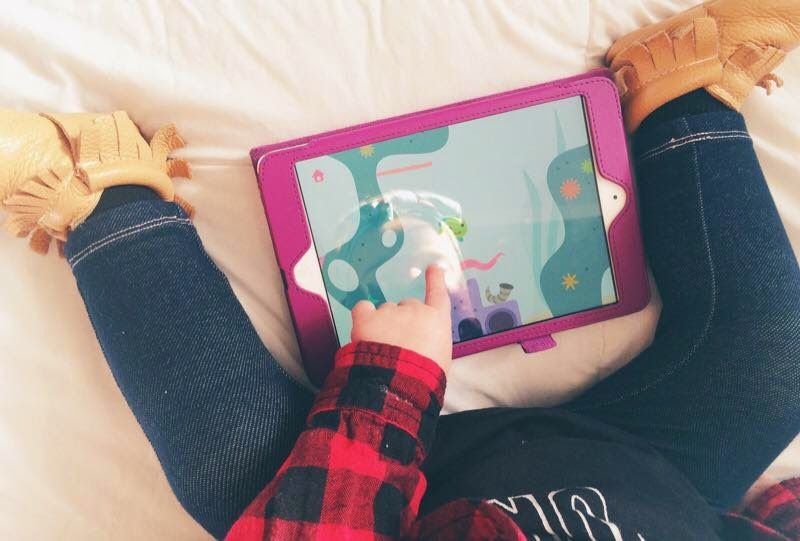 Trial and error brought me to this list of apps that are great for kiddos who just want to touch and see a response, or listen to fun sounds and songs. There are lots of games for ages 2 - 4 that require counting and answering questions, but B isn't ready for that just yet. I love seeing her playing with these apps and actually interacting with them, knowing what she is supposed to do. Smarty pants! If you have a little one under 2 that likes to play with your iPad, try some of the apps below. We LOVE them! And maybe grab this iPad case that is safe for babies! This was our first baby app. We got this app for B when she was very little and we would prop up the iPad up on it's stand and let her listen to the music while she played in her activity centre. It rotates a bunch of nursery rhymes and popular children's songs. You can get songs for free, and then download song packages for WAY less than the price of a CD. I like it because each one has a cute little animated music video. There is also stories you can download with videos that go with them! It's great for many ages. Download here! 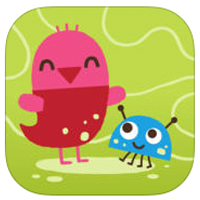 Sago Mini makes a lot of adorable apps for little ones, however most of them cost money. I will likely get some more for B eventually, but right now we have two that were free that she really loves. Ocean Swimmer is one of them. 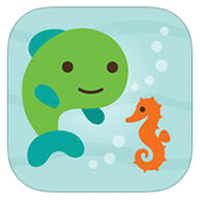 In the app you are a little fish and you swim through the ocean (guided by tiny fingers). Anything you see on your travels (plants, other fish, objects) can be interacted with. It's simple yet captivating for little ones. I believe it is always free. Download here! This one we downloaded when it was free. It's normally $3.49 I believe, but totally worth it. You hatch a bug from an egg by clicking on it and colour it however you wish. Then it hatches again (I guess that doesn't make sense, but B loves hatching it..), and you pick a hat for it to wear. Then you feed it and clean it and take it's picture! It's easy to use and very cute. It also stores all of your child's bugs so you can go back and look at them! Download here! 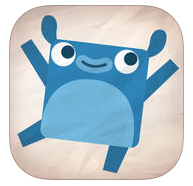 Endless Alphabet by Originator Inc. This is a bit advanced for B so we play together, but it's a great way to learn letter recognition. We downloaded it when it was free. It is normally $7.99 and comes loaded with words. Little monsters scurry by and make the letters of the word go out of order! When you move the letters back to their proper place, they repeat the sound each letter makes, and animate. After the word is fixed, there's an animation that demonstrates the definition of the word, and a narrator defines the word. It is great for B as she grows. Download here! 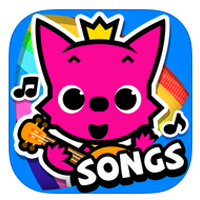 This is simply a little board of musical notes that baby can play with just by tapping. This is one of the easiest games for little ones to play, because all it requires is tapping and it makes sounds. As the child gets older and learns patterns and colours, or learns musical notes, they can play actual songs. But we just use it for the fun music sounds. 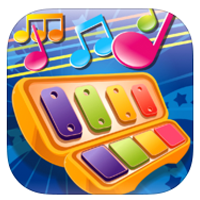 The app itself is free, but you can download other boards that make sounds of different instruments. Piano sounds are free and come with the download. Download now! Are there any apps you love that I haven't listed above? Tell me about them! I am always looking for more/new ones.